We figured we should follow up that last post Polar bears and dogs playing by featuring other K9. 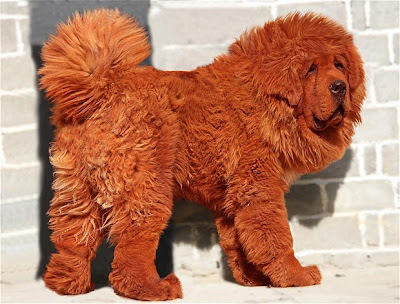 Particularly the most expensive K9 in the world, the Red Tibetan Mastiff named Big Splash(pictured above). He is 11 months old 3 feet high(shoulder) and weighs in at 180 pounds. He was sold recently for about $1.5 million. This breed has been know to "fetch" high prices in the past. High level of intelligence, Independence, and extremely protective nature make this a great breed of dog. These are all things that add to the value. What adds to the price is the fact they are very rare in China(approx 160 pure bred) and they are looked at as a holy animal.